After a failed attempt to fight off accusations of forgery, Slovene Democratic Party of Janez Janša issued an “Apology and clarification to visitors of our website” where it stated that “upon revising the entire procedure of collecting the archive documents a year ago, we cannot claim that all documents were sent to all addressees [as implied by the published document]“. The party goes on to state that it now “allows for the possibility that due to (dis)organisation of the SZDL archives in the Archive of Slovenia, the particular archive included documents which were not part of the letter of July 2 1980. Should this really be the case, it was an error on our part because we did not check the document thoroughly enough and in that case we apologize to our readers“. However, the party explicitly refuses to apologize to President Danilo Türk, and now says that the president “was member of the highest circle of Slovenian leadership at the time and was informed about the Velikovec case. Those documents, which were without a doubt addressed to him, report on trial of UDBa [general moniker for SDV secret service] operatives. He was privy to the background unknown to ordinary citizens. He knew the background in 1980 and he knew them in 2010 when he gave a medal to protagonist of the bombing Tomaž Ertl“. SDS concludes that the whole thing is only one more reason for the secret archives to be declassified. Wow. No, seriously. Wow! Cornelious said it best in his comment yesterday: this really is a non-apology. Something along the lines of “oops, we fucked up, but we proved our point regardless”. Well, SDS didn’t prove their point. Far from it. The party and its president only proved that they are willing to take unfathomable liberties with publicly accessible archive material. Bob knows what they would do with classified documents. And even if those documents were declassified (the government keeps them secret invoking interests of the national security), SDS lost any and all justification to interpret them. Not only are they playing dumb. They’re taking everyone else for dumb as well. I mean, the documents were in their possession for a year. A year! And it is only now that they discover a “mistake”? What other “mistakes” did they make in the past? All Janša and SDS had to do to win the 2012 elections is to sit back, look pretty and keep their mouth shut for the next eighteen months. Instead they’ve proven beyond any reasonable doubt that there is no limit to what they’re willing to do to regain control of this country. 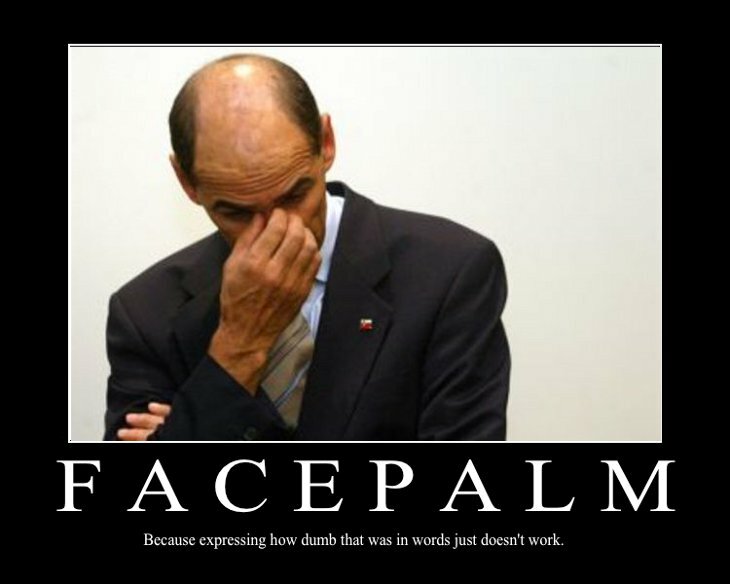 Expressing how dumb that was in words just doesn’t work, hence: facepalm.